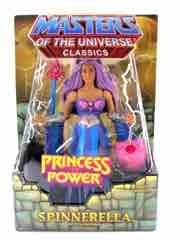 I sometimes think Masters of the Universe Classics was done on a dare. 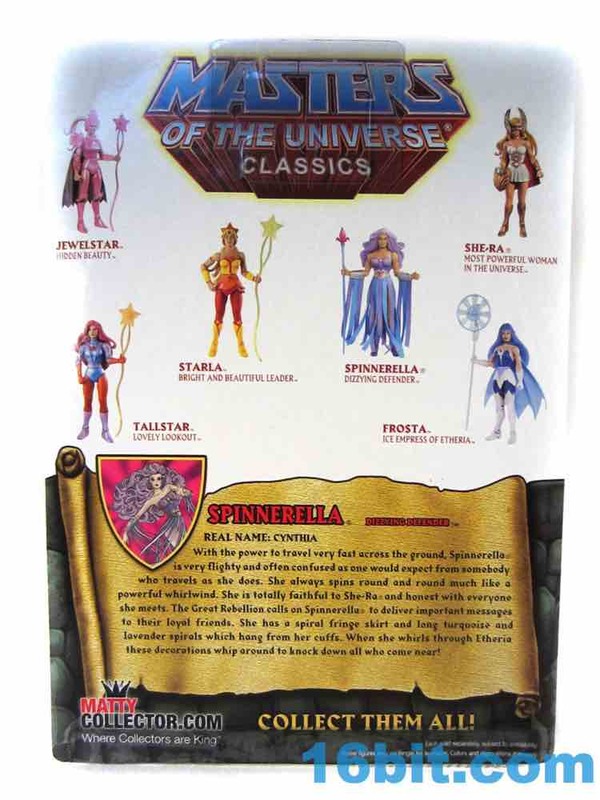 He-Man and Skeletor could probably sell in nearly any format, but continuing a line down to characters like Spinnerella seem to serve no purpose other than to prove someone at Mattel said "Wanna bet?" when someone said "You can't have everything." 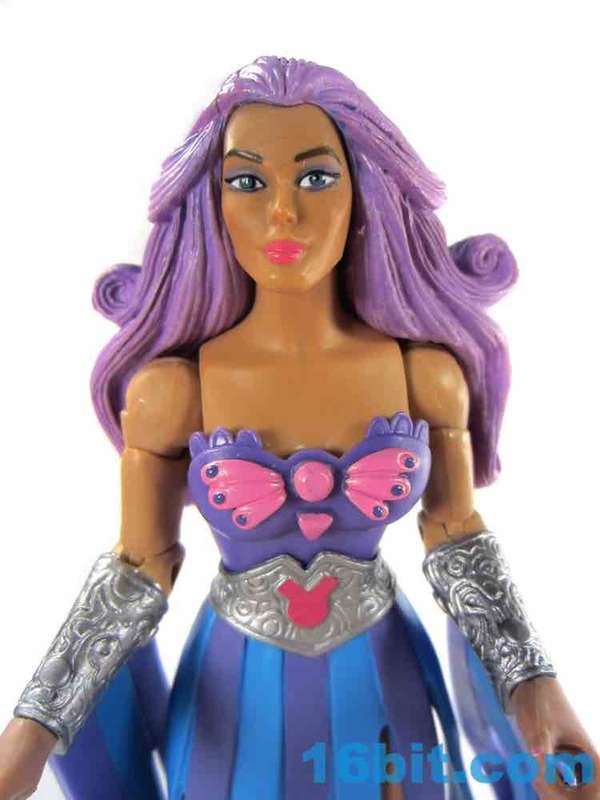 With no action feature the designers gave her some extra parts to ensure she's interesting, but the shield - a nifty update of the original one - won't fit on her arm without a fight. She's a nice figure, but like so many of these the real question is if you want it - because you probably won't miss her if you don't. 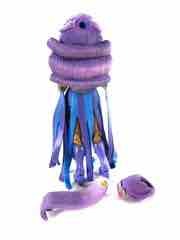 The figure is loaded with new parts, including vambraces featuring purple and blue fringe. 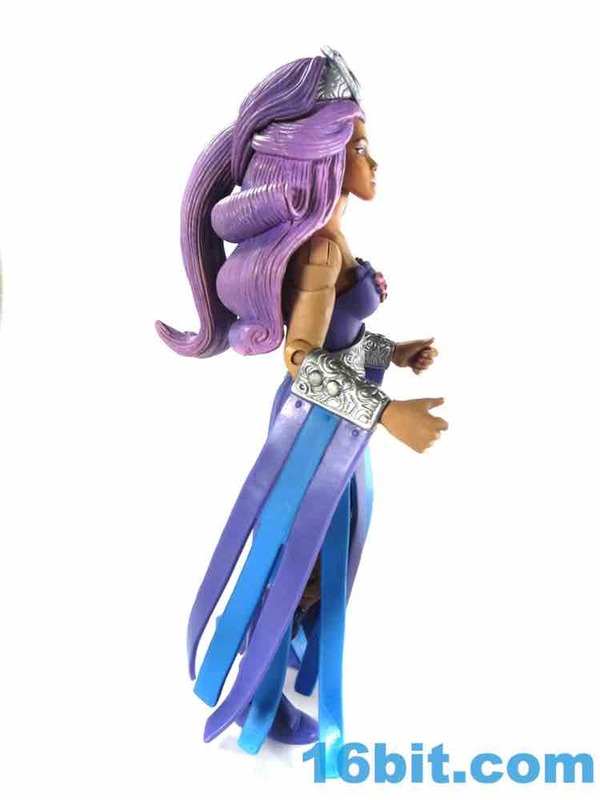 It's flexible plastic, but it won't fly if you spin her around - it's too thick for that. They aren't ribbons. 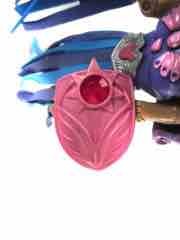 Her armor is mostly new, with great silver paint and wonderful sculpted detailing. 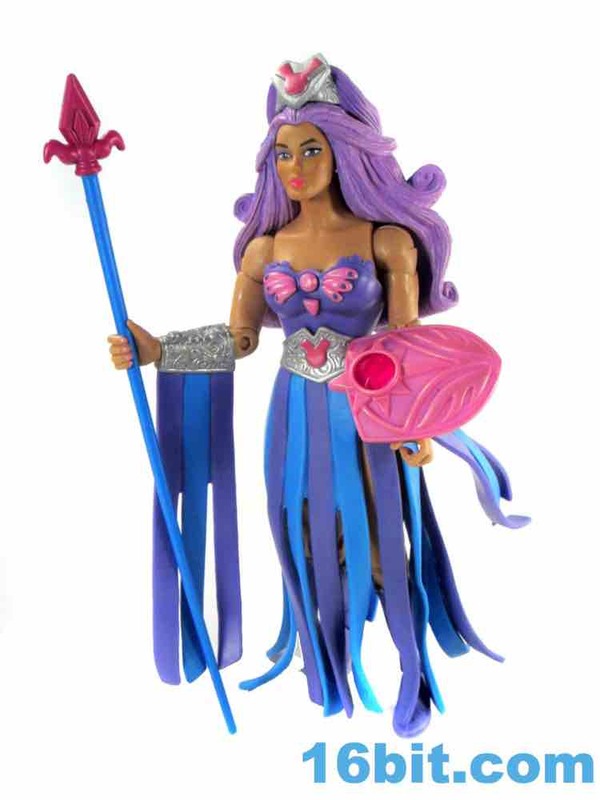 Thanks to the faux ribbons, the shield doesn't quite fit as you might want - it can clamp over the top of her arm, though. 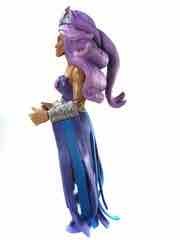 Articulation is the same as it ever was, sporting just north of 20 joints depending on how you feel like counting shoulders and hips. She moves well minus a little bit of hip restriction thanks ot her skirt/dress pieces being cut lower on one side than the other. Her chest butterfly has painted detail and dots on the wings, and it looks fantastic. 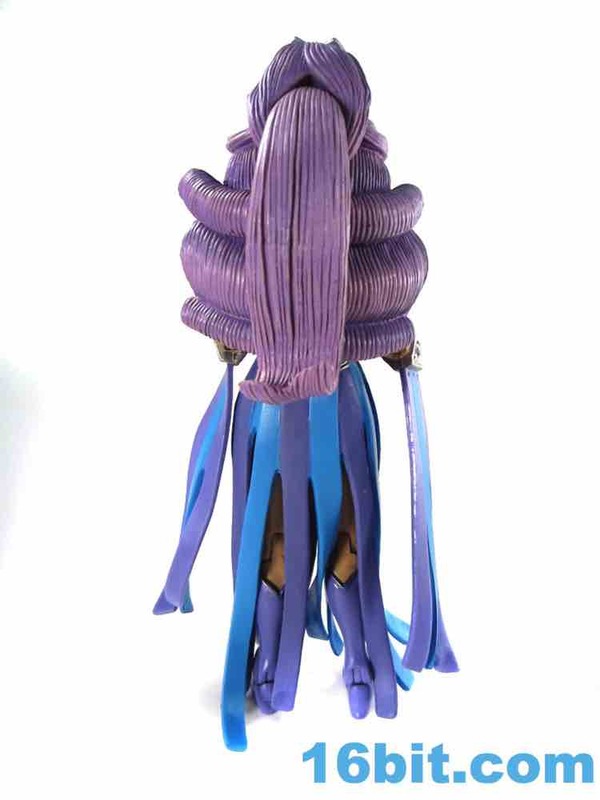 Her boots have some added dark purple trim you won't see, but what you will see is another gorgeous paint job on her face - no complaints - plus a really complicated hair piece. 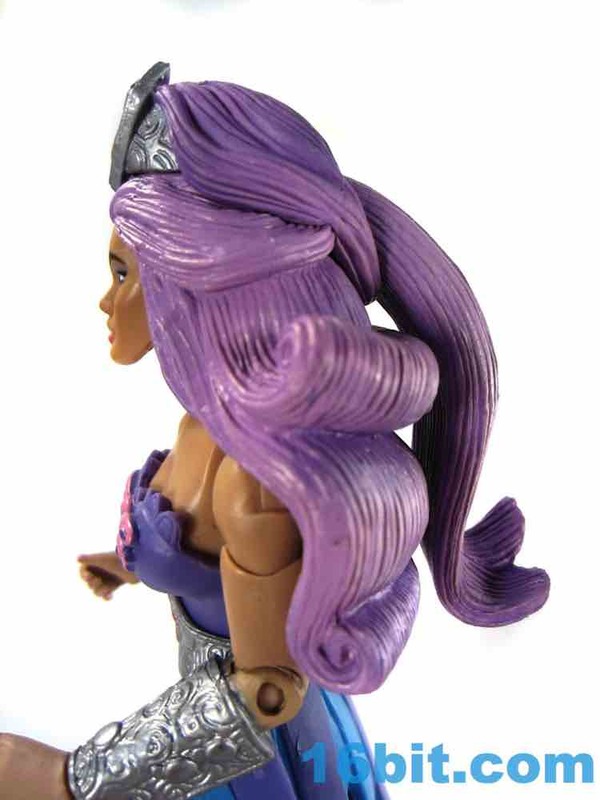 Not content to do "toy hair" or "cartoon hair," the Four Horsemen added two removable pieces to her head. 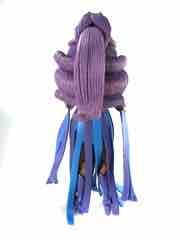 A peg on a ponytail plugs in to the main head, and an optional ring adds a crown of hair to that. 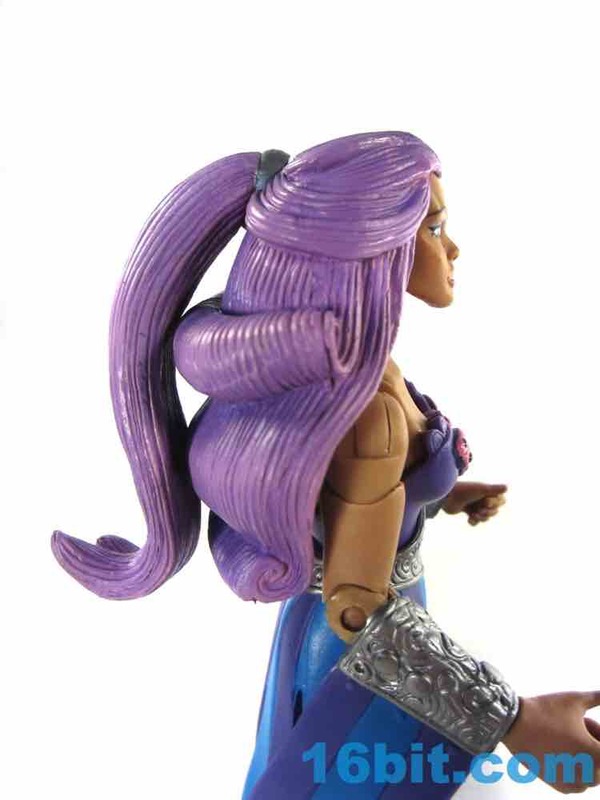 I find it ridiculous, but it's a good recreation of the original toy's voluminous hair. The purples and pinks all pop nicely, and the silver jewelry on the front of her head is pretty simple. I won't say it is fun or impressive, because from where I sit it's overkill. 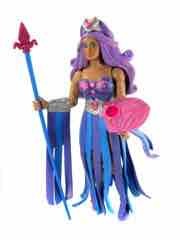 As armaments go, she has a swell staff which helps prop her up and a shield. 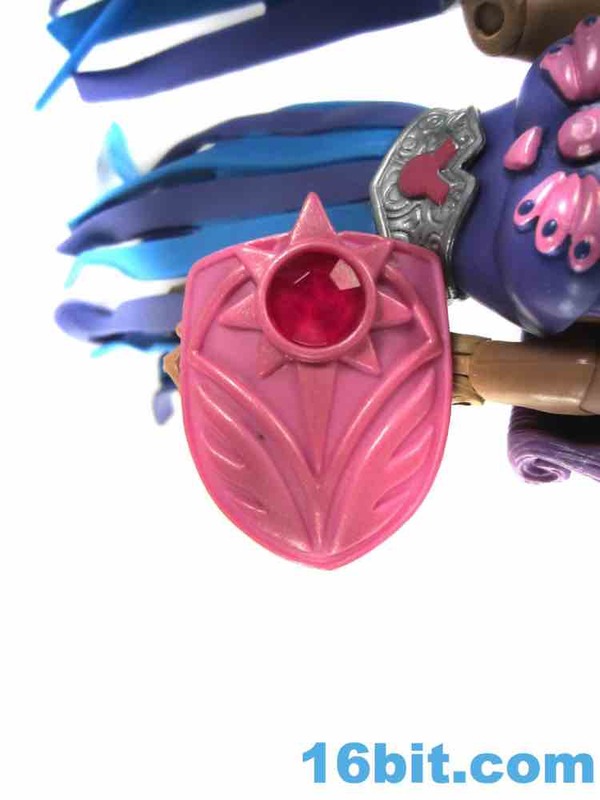 The shield is pink with painted metallic pink highlights, plus a clear darker pink gem on it. 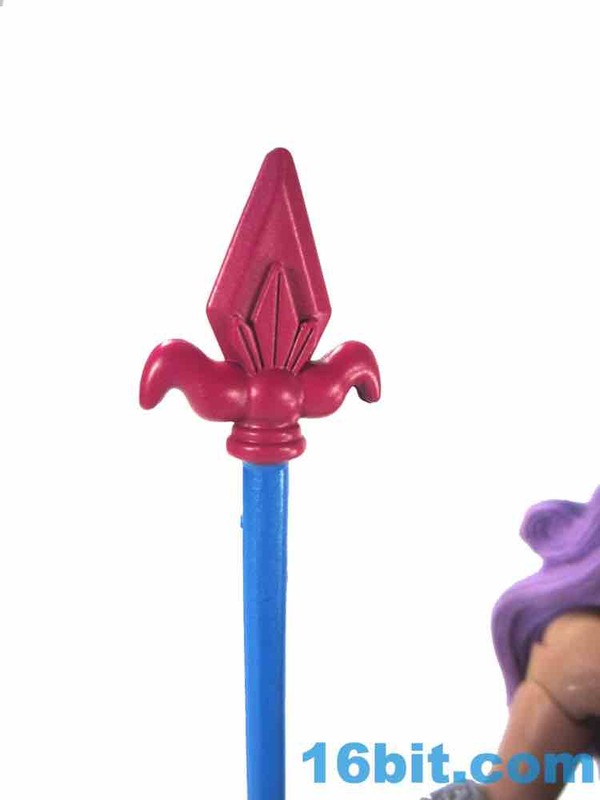 Since she can't hold it particularly well, it's kind of annoying - you can clamp it to her arm, but I can't help but wonder if they couldn't have tweaked the arm (or shield) to better fit. It looks nice. 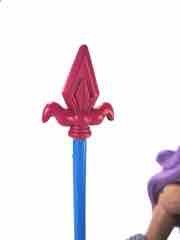 The staff is blue with a pink tip, and it works as a third leg to keep her upright if you feel you'll need it. 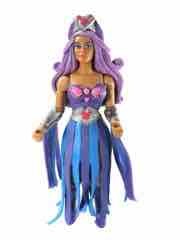 So far I find her to be quite sturdy without any flopping or plopping on my desk. 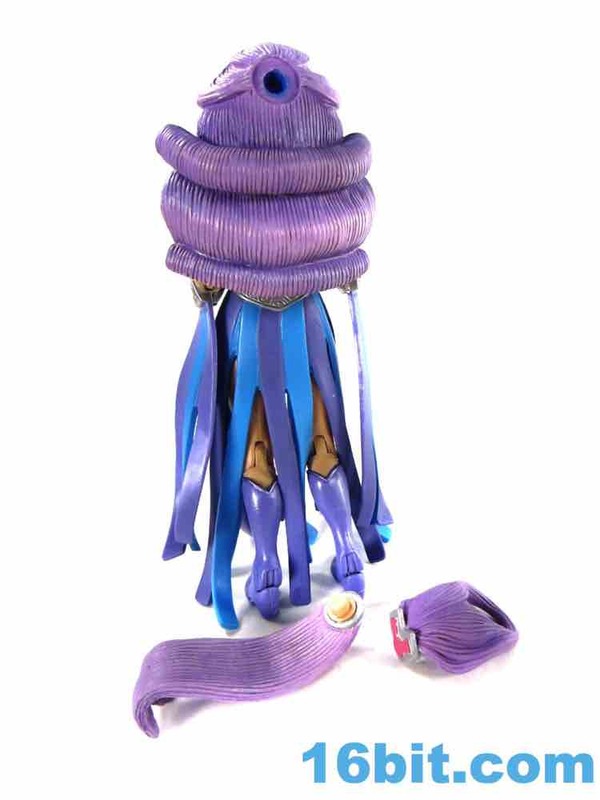 I can't help but admire the great paint job, good sculpting, and unique design flourishes to translate a doll to an action figure. 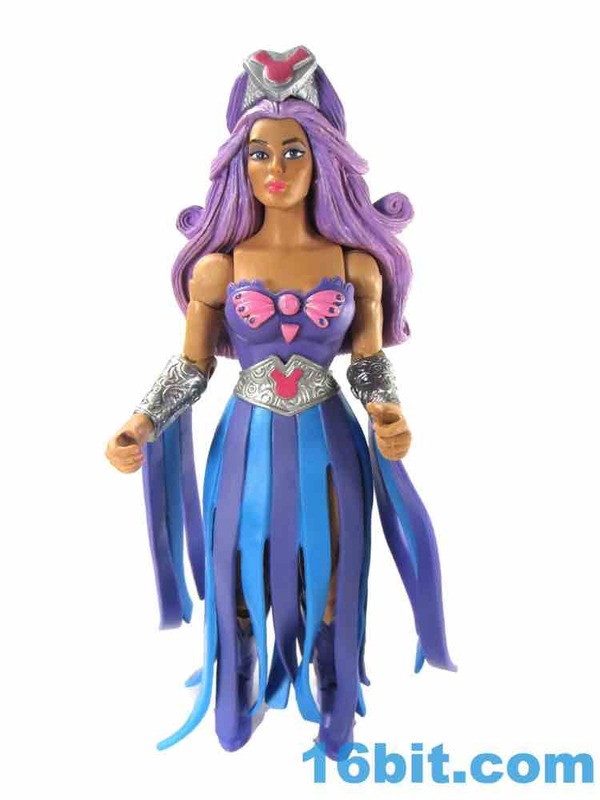 I also wish it was a better action figure - posable plastic doll isn't too exciting, and the hair ring, while neat, is not a selling point. For fans of this line who really want to have everything, this is a gem. 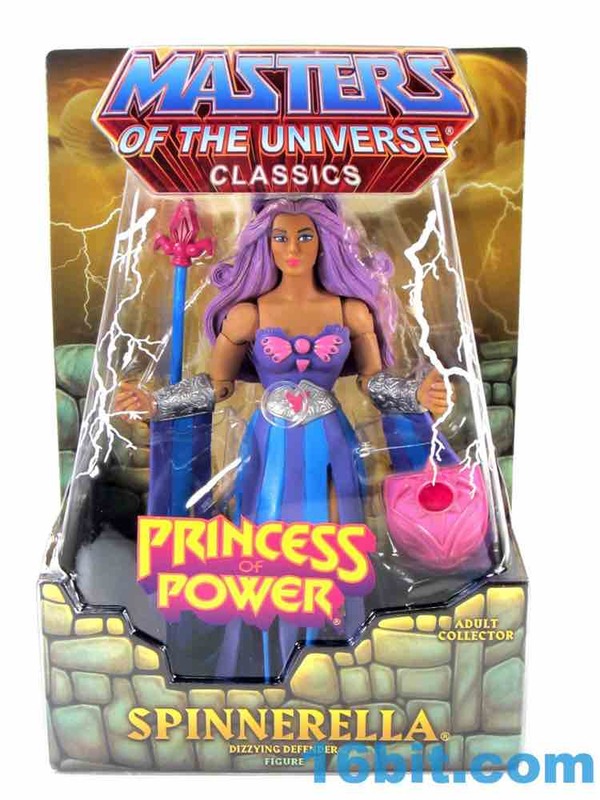 For cartoon fans, I think she appeared once - and that's not particularly exciting when other creatures and vehicles and monsters could be made instead. 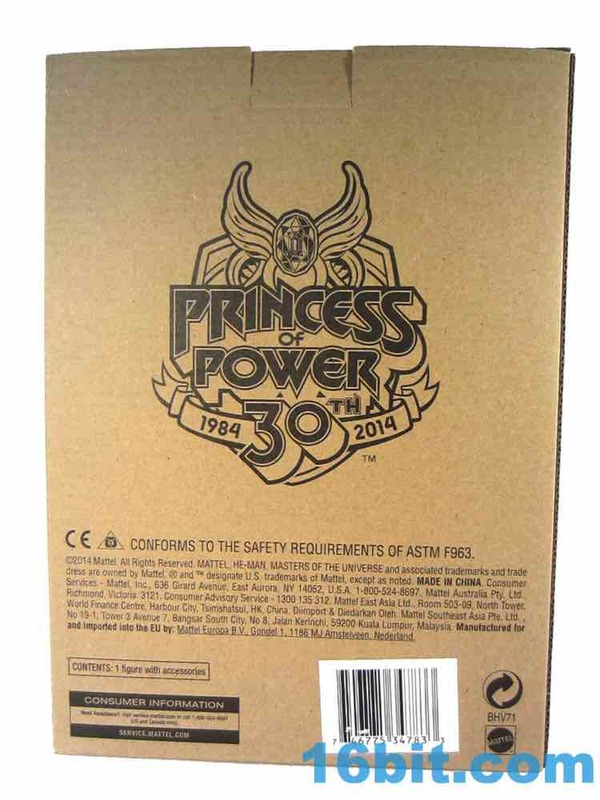 If she's cheap you could probably do worse, but I'm just seeing this one as shelf filler.